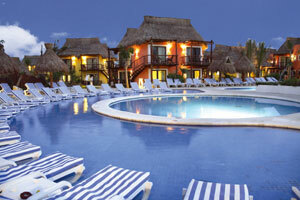 Iberostar Cozumel is an all-inclusive, family-friendly resort, sitting on the edge of a beautiful bay in Cozumel. Boasting a fine, sandy beach and a unique, freeform lake-style pool, this active resort is close to Cozumel's most famous tourist attraction, the Palancar Reef, which is the world's second largest coral reef. A true diver's paradise, the resort is designed to complement its natural tropical surroundings, offering ocean view and garden view rooms and suites in one and two-story bungalow-style buildings. Guests looking for peace, tranquility, relaxation and phenomenal water sports will be in heaven at this idyllically rustic retreat. Located on the southwestern coast of the island, the all-inclusive Iberostar Cozumel sits on the edge of a beautiful bay boasting a fine sandy beach and a unique freeform lake-style pool area. After recent renovations, the resort is truly going green—Iberostar Cozumel is the island's first Green Globe resort, an accolade that becomes immediately apparent from the lush foliage, diverse wildlife and proximity to natural beauty outside the resort. Situated directly on the beach, this family-friendly resort is minutes from Cozumel's most famous tourist attraction, the 'Palancar Reef', which is the part of the world's second largest coral system. A true diver's paradise, the resort is designed to complement the natural surroundings of Cozumel, offering ocean view and garden view rooms and suites in one and two-story bungalow-style buildings which are situated among lush mangroves that are bursting at the seams with exotic wildlife. Guests looking for peace, tranquility, relaxation and phenomenal water sports will be in heaven at this idyllically rustic retreat. Iberostar Cozumel has recently completed renovations to the main lobby, staircases and restaurants. Be sure to check out these newly revamped locations! Transfer time from the Cancun airport is approximately 2.5 to 3 hrs. 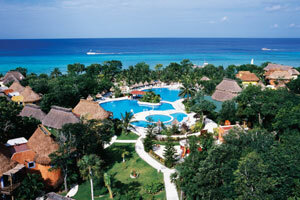 (by bus and boat) and approximately 20 minutes from Cozumel Airport (by taxi). Your stay at Iberostar Cozumel includes complimentary access from 9 am - 6 pm to these Iberostar Resorts. Night passes available for an additional fee, transportation not included. Explore the diver’s paradise of Cozumel with diving packages available for purchase through Iberostar Cozumel. Options include: One or two tank diving, equipment rental, cenote dives, PADI courses and more. Resort Discount Credits are eligible for use on a room upgrade, spa treatments, wine, a romantic dinner and more when you travel through December 20, 2018! Please Note: Ferry operation from Playa del Carmen to the Island of Cozumel operates every hour starting at 6:00AM to 9:00PM. 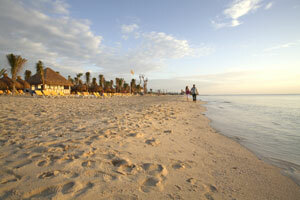 Ferry service from Cozumel to Playa del Carmen operates every hour starting at 6 am to 8 pm.